We found a supplement for you and your baby that you can be happy with! If and when you decide that you need supplemenation, there's now an organic choice made by Horizon! 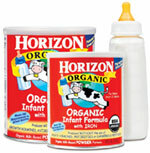 Horizon Organic Infant Formula with Iron is patterned after breastmilk and made with high-quality, certified organic fats, carbohydrates and proteins, plus all of the essential vitmains and minerals a healthy baby needs. It's a formula that meets all FDA requirements for healthy, full-term infants, so you can be sure that your baby will receive complete and balanced nutrition. Horizon Organic cows are fed certified organic grain and hay, grown without synthetic fertilizers or pesitcides and their cows are never given synthetic growth hormones or antibiotics. LAPregnancy's test babies LOVE the stuff!